Like Harsika, the woman in this photo also lost her husband. They both found comfort through the prayers, support and encouragement of GFA-supported workers. Her doctors couldn’t understand. Harsika should have been dead. Her kidneys were diseased. They failed to function. Yet the widow was still alive ... barely. 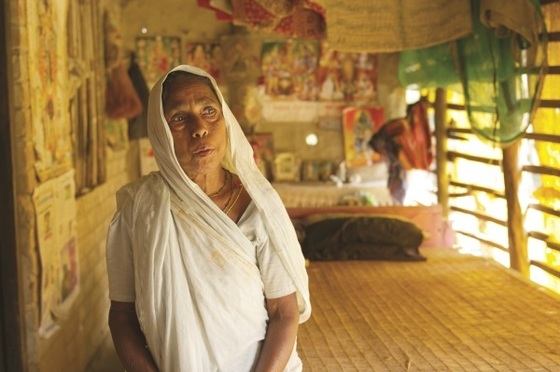 As disease ravaged Harsika’s body, worries plagued her mind. She was a widow with one unmarried son and daughter still at home. They had no money. How could her children get married if the family had no money? She was dying. Who would ever marry her children if she couldn’t arrange their marriages? Death reigned over her, and fear robbed her of peace and joy—until God sent someone who carried hope with him wherever he went. When Harsika first met GFA-supported pastor Bodhan, she discovered a compassionate ear. She poured out her troubles while he listened patiently. Pastor Bodhan didn’t have any answers in himself, but he knew about Someone who had been working countless miracles on earth for more than 2,000 years. As they talked, hope bloomed in the worried widow’s mind. Pastor Bodhan prayed for Harsika, and she responded in faith. After that encounter, Harsika decided to start attending worship services. When Harsika came to the church the following week, Pastor Bodhan and all the believers prayed for her. She came back the following week, and the ones after. As time passed, Harsika’s health improved—without any treatments! Today she is a living testimony of the power and love of God to everyone around her. Praise Jesus!